Dmitri Matheny, winner of NW Jazz Instrumentalist of the Year honors in this year's Seattle Earshot Jazz Golden Ear Awards, is celebrated for his warm tone, soaring lyricism and masterful technique on the flugelhorn. He has been lauded as “one of the most emotionally expressive improvisers of his generation,” by the International Review of Music. First introduced to jazz audiences in the 1990s as the protégé of Art Farmer, Matheny has matured into “one of the jazz world's most talented horn players,” according to the San Francisco Chronicle. 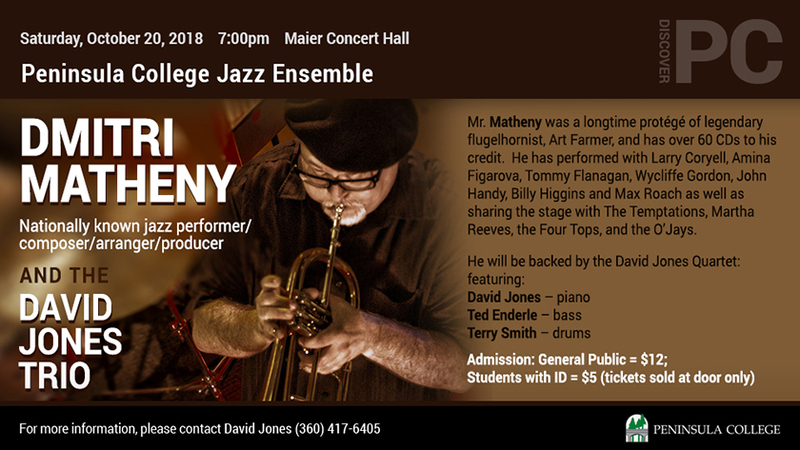 On October 20 at 7:0 0 pm Peninsula College will welcome Matheny back to the college’s Maier Hall for the fifth time in as many years. Although his appearances in Seattle, Portland, Tacoma, Everett and Bellingham are more frequent since he relocated to Centralia, it is a special treat to hear him in the splendor of Maier Performance Hall. He always brings interesting takes on a wide variety of tunes. This show promises the same essence, featuring, timeless standards by Louis Armstrong and Jimmy Van Heusen; bebop-era classics by Miles, Bird and Oscar (Pettiford); cinematic themes by Charlie Chaplin, Henry Mancini and John Williams; tunes by Luiz Bonfa and Keith Jarrett; and fresh originals by Matheny and David Jones. This ensemble features jazz musicians from many different groups around the north Olympic Peninsula and the Puget Sound region: David Jones (piano/electric piano), Ted Enderle (bass) and Terry Smith (drums). The soulful sound of Matheny’s horn frequently draws comparisons to Miles Davis, Chet Baker and--not surprisingly--to Art Farmer. He has toured extensively throughout the United States, Europe and Asia. He has traveled to 19 countries and has performed with many Motown and popular music acts including the Temptations, Martha Reeves, the Four Tops, Frankie Avalon and the O'Jays. Matheny has also performed in the jazz arena with Larry Coryell, Amina Figarova, Tommy Flanagan, Wycliffe Gordon, John Handy, Billy Higgins, Red Holloway, Charles McPherson, James Moody, Sam Rivers, Max Roach, Sonny Simmons, Billy Taylor, and Bobby Watson. His discography lists over 120 compact discs on which he appears as a composer, arranger, producer, annotator or flugelhorn soloist. He has released eleven critically-acclaimed albums as a leader: Red Reflections (1995), Penumbra (1996), Starlight Café (1998), Santa's Got a Brand New Bag (2000), Nocturne (2005), The SnowCat (2006), Spiritu Sancto (2007), Best of Dmitri Matheny (2008), Grant & Matheny (2010) and Sagebrush Rebellion (2014). His latest CD, Jazz Noir (2016, BluePort Jazz) offers a fresh spin on crime jazz, film noir and timeless classics. It showcases the talents of “some of the most accomplished musicians in the western United States” (All About Jazz): Bill Anschell, Matt Clark, Nick Manson, Charles McNeal, Susan Pascal, Phil Sparks, Todd Strait, Akria Tana, Jay Thomas and John Wiitala. Matheny has received several prestigious music awards, including “Talent Deserving Wider Recognition” in the 46th Annual Down Beat International Critics Poll and “Best New Artist” honors (with Brad Mehldau, Ravi Coltrane and Stefon Harris) in the1999 JazzTimes Readers Poll. He is also a prolific composer and lyricist whose published compositions span the jazz, pop, symphonic, choral, chamber and world music genres. He has received premieres and commissions from Meet the Composer, St. Domenic's Church, the Manhattan New Music Project, the American Society of Composers Authors and Publishers (ASCAP), the Jazz Composers Orchestra and 20th Century Forum. Dr. David P. Jones is the head of the Music Program at Peninsula College and has served as director of PC’s Jazz Ensemble since 2008. He has performed with Bob Curnow, Mike Bisio, Brad Sheppik, Jazz Police, Craig Buhler and many other local jazz musicians. His trio with Ted Enderle and Terry Smith has backed Dmitiri Matheny, Mark Lewis, and John Stowell as well as performing several times in the Port Angeles area over the past few years. Dr. Jones is also a noted jazz composer/arranger whose works have been performed by the Bob Curnow Big Band, Jazz Police, Jim Cutler Big Band, Straight No Chaser Big Band (UK), and many college jazz ensemble including those from Indiana University (conducted by David Baker), University of Missouri-Kansas (Bobby Watson), University of Iowa (John Rapson), Rutgers University, University of Washington and Peninsula College. His jazz ensemble compositions have been heard at the following jazz festivals: Reno, Lionel Hampton, University of Alaska-Fairbanks, Eau Claire (WI) and Tacoma. Tickets will be available at the door for $12 general admission and $5 for students with public school or college ID. For more information contact Dr. Jones at djones@pencol.edu or (360)-417-6405.